For improvement of technical facility, endurance, range, flexibility, sound and expression; for jazz and classical and commercial players. 16 pieces from the swashbuckling blockbusters. Whether sad, grand or dramatic - hardly any instrument knows so many tones as the trombone. 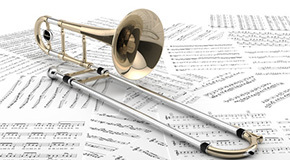 Within our large selection of over 5,000 trombone sheet music titles from every style and genre, along with trombone method books for various age groups, playalongs, études and music pieces for solo trombone, you can also find sheet music for the B flat, alto and bass trombone.